We left behind in Nako, the barren, scenery that characterised the Spiti Valley. As we dropped in altitude, we were greeted by green alpine forests, that probably seemed that much lusher after an absence vegetation. 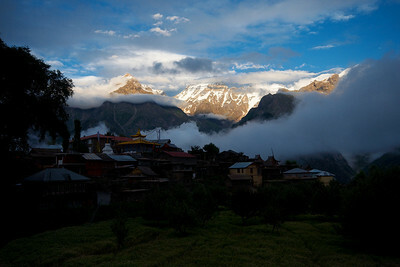 We were even greeted by light showers as we entered the Kinnauri village of Kalpa in the early evening. We decided to stay two nights at a small family guest house a short climb above the village centre. We were in serious need of rest in order to recover from the bus rides and Kalpa seemed to offer a lovely setting for doing nothing. 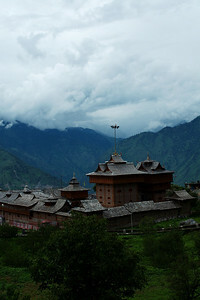 Other than the mountain scenery, Kalpa's main attraction is its temple. A collection of intricatally carved wooden buildings, built in the traditional Kinnauri style. This style is marked by its “balagad” shaped roofs and carvings depicting the natural environment. Of particular intrigue were the very well-endowed male animals, whose images occupied a large portion of our camera's memory card space. From the building eaves hang hundreds of delicate chimes that eerily resonate when the wind blows. Our second day in Kalpa happened to coincide with an annual celebration of the village deity. This celebration was marked by a procession through the streets of Kalpa by village's men. As we ate on a hotel patio we heard the beating of drums and the sound of trumpets which is actually what led us to catch a glimpse of the large black item, the village deity, as it was carried up towards the temple, the procession's ending point. The stream of green-capped men followed the deity, in a state of alcohol-induced gaiety. I was drawn into the festivities and followed the procession into the temple. I left the others to settled the bill while I entered the temple grounds. 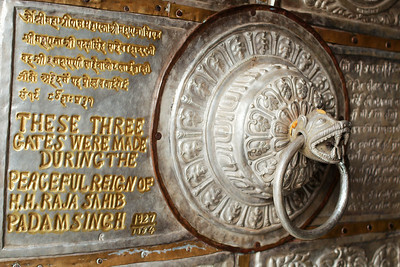 A group of men had already begin performing a ceremonial dance with the deity, while the village band accompanied them. Although very welcoming, the men were becoming increasingly rowdy, and were particularly enamoured by the presence of lone foreign woman. Even once Yann had joined me I had the feeling that the presence of foreigners was somewhat of an unwelcome distraction. 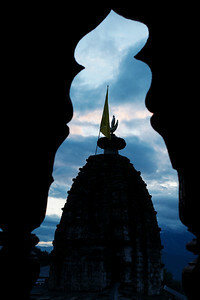 So we quietly left the temple heading towards the outskirts of the village to wait for the sunset. Despite our distance, we could hear the loud, monotone chanting emanating from the temple celebrations. The chants seemed to call on the clouds to lift, revealing for the first time since our arrival in Kalpa, the snow-capped peaks of the sacred Kinner Kailash mountain range that were actually surrounding us. We watched until the last sliver of light had disappeared from the sky. We headed for bed expecting that the village men would continue their celebrations throughout the night. 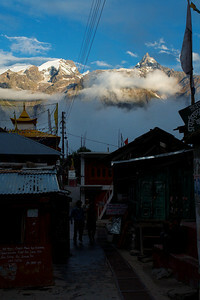 From Kalpa, we took a small detour from the main highway to visit Sarahan, location of the Bhimakali Temple. A multi-story construction of alternating layers of timber and stone whose original construction dates back over 800 years. As a temple honouring the local manifestation of the blood-thirsty goddess Kali, it has been a site of sacrifice for hundreds of years. Apparently even human sacrifices as recently as the 1800s. It seems a strange contrast from the beauty of the temple and its surroundings. Unbelievably, we had the temple entirely to ourselves. We stayed in the temple guest house, as possibly its only guests, with a balcony looking over the courtyard entrance to the temple. The architectural wonder was ours to explore and admire without any distraction. Nako - "Land of Fairy Tales and Fantasies"